Mixed Green Salad with sliced pears, golden raisins and toasted pecans. Bring a large pot of salted water to a boil. Add brussel sprout and cook just until tender and bright green, about 5 minutes. Drain and set aside. Meanwhile, blot capers on a paper towel. Heat oil in large frying pan over high heat. Add capers and cook, stirring carefully (mixture will splatter), until capers start to open and are brown and crisp, about 5 minutes. With a slotted spoon, transfer capers to a paper towel to drain. Add garlic and anchovies to pan and cook until fragrant, about 1 minute. Add brussel sprouts and chile flakes and stir to coat with oil. Cook, stirring occasionally, until starting to brown, about 5 minutes. Transfer to a serving plate and sprinkle with capers and a squeeze of lemon. I usually chop bacon or pancetta and saute until crisp, remove to paper towel to drain, and use some of the grease with the olive oil to saute the garlic and anchovies. Then add the bacon/pancetta pieces at the end along with the capers. 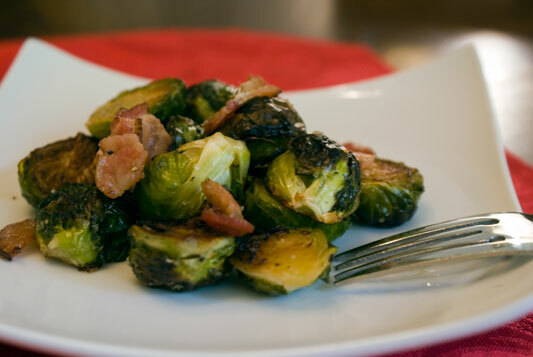 This entry was posted in Brussel Sprouts, Nutrition, Recipes.